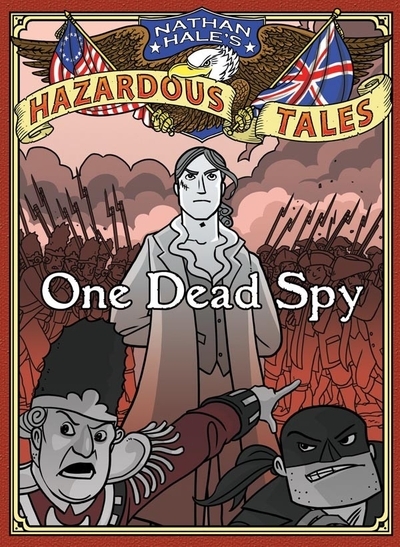 Nathan Hale's Hazardous Tales: One Dead Spy (10 out of 10 stars) Nathan Hale. Hardcover graphic novel, 128 pages. Published by Amulet Books, 2012. I’ve been a fan of Nathan Hale for a while. Nathan Hale the author and illustrator, not the patriot, although you could be pardoned the confusion. I loved his illustrations for the graphic novels Rapunzel’s Revenge and Calamity Jack, and his picture book Yellowbelly and Plum was one of my sons’ favorites. Hale’s current series has moved him to the top of my list. 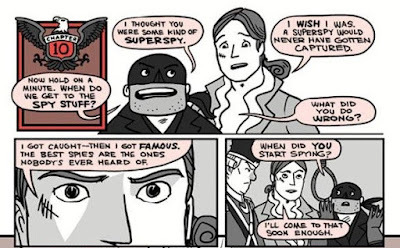 In 2012 Nathan Hale and Amulet Books started a series of graphic novels based on American History, under the banner (literally) Nathan Hale’s Hazardous Tales. The first book in the series is One Dead Spy, and it and the following books are interesting, easy to follow, and downright entertaining. I’m buying every one of them. One Dead Spy is about Nathan Hale (the patriot, not the author), executed in 1776, at the very beginning of the American Revolution. The 128-page hardcover comic begins with Manhattan in flames, and a whistling Hangman bringing a noose to a gallows. He shoos a bald eagle away, and prepares Nathan Hale to be hanged. They’re soon joined by a British Officer, and these three will be the narrators for the rest of the book. Given an omniscient overview of American History, Hale sees what the destiny of the country is, and even though things look grim for the colonists (and more especially for Hale personally) in September 1776, he knows that there’s a brighter future. He proceeds to tell the Hangman and British Officer all about the American Revolution, focusing on the first year, and Hale’s role in it. Nathan Hale makes a good narrator for the years 1775-76, and his path crosses with the likes of George Washington, Henry Knox, Ethan Allen, Benedict Arnold, General Howe and other notable heroes and villains of American History. The author uses these interactions to tell the key events of the revolution, including the capture of Fort Ticonderoga, the Battle of Bunker Hill (and Breed Hill), the Boston Massacre, and the Declaration of Independence. He leaves a lot of things untold, telling more of his tales in future volumes, but gives us enough information to make this book a solid read. As a history teacher, parent, geek, and promoter of graphic novels, I love this series. 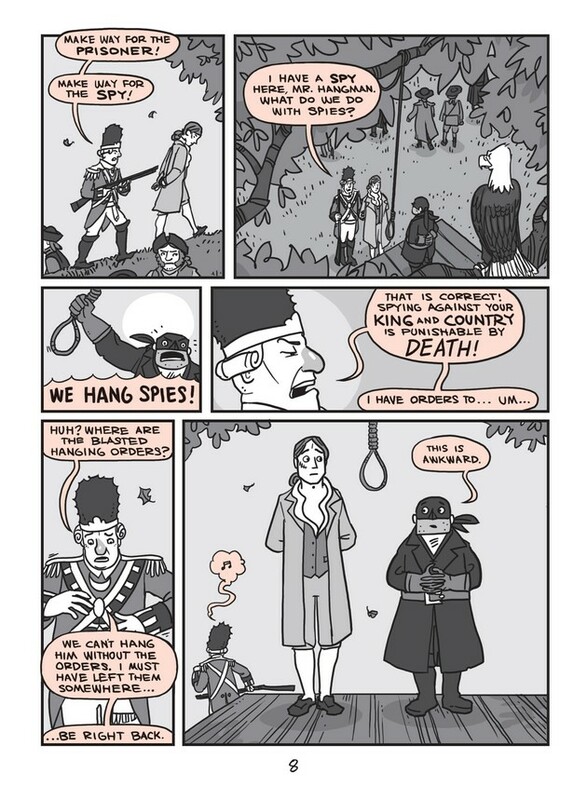 I enjoy the humor and the menace in One Dead Spy—even as the Hangman provides comic relief, you can’t forget that the real narrator, Nathan Hale, was executed. Some of the humor is in asides, some is in telling the truths of history that are often left out of the dry history books. The illustrations are cartoony but excellent, with no confusion about who's who in the course of the story. Hale (the author) also doesn’t shy away from telling us when people suffered and died, making this more mature reading than you might expect. I loved it. This whole series is one that kids from 4th-8th grade seem to really connect with. I've seen it with my own sons, and I've seen it with students and their teachers. I love how by telling a relatively small story (of Nathan Hale), Hale (the author)(confusing) is also telling the larger story of the American Revolution, and how it meant different things to different groups of people. It makes a good template for research projects, including Wax Museums, History Fairs, and National History Day competitions. Hale includes a bibliography and research notes at the end of each book, and you're able to see how he made the connections found in the text itself. When teaching a graphic novel, don't forget to use the visual elements of the book -- why are certain characters drawn the way they are, what symbolism is in the artwork, and how do the art and words combine to tell a fuller story than either would on their own? If you're looking for a way to ease graphic novels and comic books into an upper elementary or middle school classroom, this series is a great place to jump in.